Apple MacBook Pro in every one of these sets. Continuous fader control, possibly augmented by encoders, in each setup – sometimes also via touch controllers, but always with some physical faders. I’m also surprised by the number of people using the monome. The MacBook phenomenon could easily be a subject of another article, but I think Apple’s predictability – in OS setup, in components, and in repairs – is invaluable in a big gig. And Ableton Live has achieved ubiquity in what most people consider live electronic sets of this kind. Where you may see more variation are in other contexts – think bands, or think smaller acts and individuals who roll their own solutions. 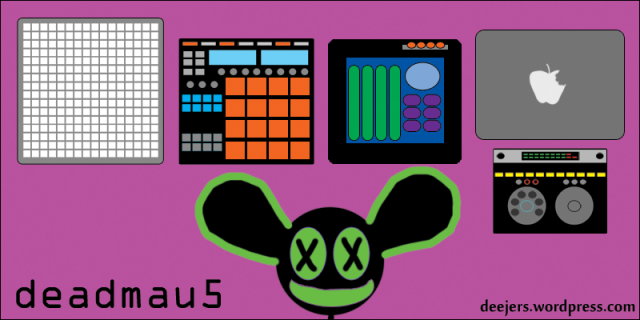 But given the earlier deadmau5 debate, it is interesting just how much control each of these artists has. Whether that’s there for show, whether it’s there to legitimately give them dynamic playing abilities, or just to break their own monotony, well, that you have to watch them live to judge. But the options are there, for the dead…mice (mi53?) of the world, and for you. You can press whatever you like. 2. Any artists whose rigs (down to the individual Max or Pd patch) you’d like us to investigate? Side note: what a pleasure to cover a new blog – I remember the old days when this happened more often. If you have one, keep sending them in. I’m terrible about responding to email, but some tips are greatly appreciated!